The dangers of artifial sweeteners - The truth about food and medicines. When you look at the composition of this product it is not difficult to understand why there has been so much controversy. In his book, ‘Aspartame (Nutrasweet). Is it Safe?’, Dr.H.J.Roberts, a diabetic specialist and world expert on aspartame poisoning, describes aspartame as a synthetic chemical made up of three components, two of which are amino acids, phenylalanine and aspartic acid. The third is methyl alcohol, also known as methanol and wood alcohol. He explains that methanol is the first component to be separated from the aspartame molecule during digestion. It is synonymous with wood alcohol which is a deadly poison even when consumed in relatively modest amounts. Methanol can have potentially adverse effects on the brain, optic nerves and retina. Phenylalanine, normally a beneficial amino acid, is known to be toxic at high intake levels with possible adverse effects on a developing foetus. Aspartame, is linked with weight gain, particularly on the hips and thighs. Dr Roberts stated that when he got patients off aspartame, their average weight loss was 19 pounds (8.6 kg) per person. Many symptoms disappear quite dramatically, especially chronic headaches, when aspartame is totally eliminated from the diet. It is of special interest that some of Dr.Roberts’ patients reported the sudden recurrence of headaches within minutes or hours when aspartame products were resumed. Aspartame is 200 times sweeter than sugar and is in nearly every product that at one time might have contained sugar, from chewing gum and toothpaste to fruit yoghurts and certainly in some cola and fruit drinks, especially those labelled ‘diet’ or ‘light’. Dr. Roberts warns that aspartame is particularly dangerous for diabetics. The aspartame keeps the blood sugar level out of control, causing some patients to go into a coma and unfortunately, many have died. This chemical sweetener Aspartame, also known as Nutrasweet, had a very dodgy start in life when it was initially introduced in the USA. In 1980 the US food and Drugs Administration (FDA) had been refusing to license the use of this product which G.D.Searle & Co. was hoping to introduce as a sugar substitute. The FDA had even begun legal proceedings in the dispute but then in July 1981 the FDA suddenly approved the product over the heads of its own scientific committee that had protested against such approval after the chemical had been found in trials to produce brain tumours in rats. By July 1983, the FDA authorisation was extended to allow aspartame to be included in soft drinks and sodas. Sales of aspartame soared and in 1985, the giant Monsanto bought out Searle for $2.7 billion. In a report on ‘Aspartame: Methanol and the Public Health’, that appeared in a peer reviewed journal, Dr. Woodrow Monte wrote, “When diet sodas and soft drinks sweetened with aspartame are used to replace fluid loss during exercise and physical exertion in hot climates, the intake of methanol can exceed 250 mg/day or 32 times the Environmental Protection Agency’s recommended limit of consumption for this cumulative poison.” The effects of aspartame are documented by the FDA’s own data. In 1995 the agency was forced, under the Freedom of Information Act, to release a list of aspartame symptoms reported by thousands of victims. From 10,000 consumer complaints, the FDA compiled a list of 92 symptoms from coma to death. The majority of symptoms are neurological because aspartame can destroy the nervous system. Aspartame is said to worsen or mimic the symptoms of diseases and conditions such as fibromyalgia, multiple sclerosis, lupus, attention deficit disorder, diabetes, Alzheimer’s, chronic fatigue and depression. 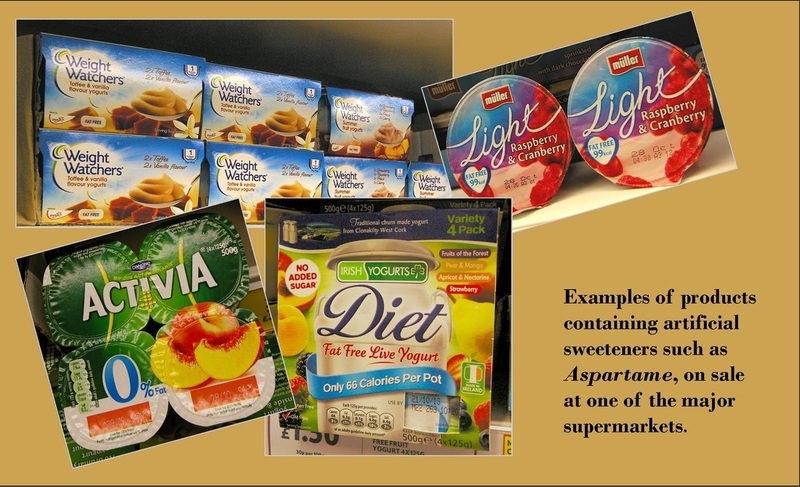 In 2007, some supermarkets in the UK were sufficiently concerned that retailing chains such as Sainsbury’s, M&S, and Wal-Mart subsidiary Asda, announced that they would no longer use aspartame in their own label products. Yet, in early 2013, European Food Safety Agency (EFSA) experts, using available information on aspartame and its breakdown products, concluded in draft that they were safe at levels currently set in Europe. NutraSweet, a former Monsanto asset, has developed a new and improved version of this neurotoxin called Neotame. Neotame has a similar structure to aspartame, except that, from its structure, it appears to be even more toxic than aspartame. This potential increase in toxicity will make up for the fact that less will be used in diet drinks. Like aspartame, some of the concerns include gradual neurotoxic and immunotoxic damage from the combination of the formaldehyde metabolite (which is toxic at extremely low doses) and the excitotoxic amino acid. The food labelling requirements required for aspartame have now been dropped for Neotame, and no one is clear why this was allowed to happen. Neotame has thus been ruled acceptable and because it is used in such small quantities it does not have to be included in ANY list of ingredients! So, if you buy processed food, that food could well contain Neotame because it is so cost-effective and since no one knows it is there, there is no public backlash similar to what is happening with Aspartame. A product called “Sweetos,” which is actually composed of Neotame, is being substituted for molasses in animal feed. Sweetos is an economical substitute for molasses. Sweetos guarantees the masking of unpleasant tastes and odor and improves the palatability of feed. This product will be economical for farmers and manufacturers of cattle feed. It can also be used in mineral mixture,” said Craig Petray, CEO, The NutraSweet Company, a division of Searle, which is a part of Monsanto.